This is a magnificent plant of rocky mountain ridges in the alpine and subalpine zones of the western mountains of North America. 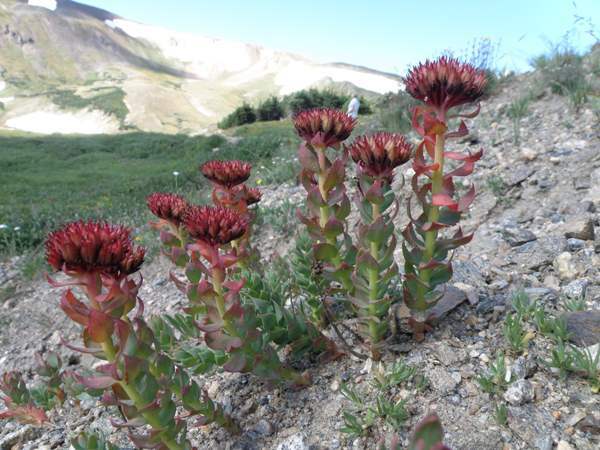 It is very similar to Queen's Crown Rhodiola rhodantha but the latter has much pinker flowers than King's Crown with its darker burnt-red blooms. This lovely wildflower grows to a height of around 30cm and forms dense colonies of plants in moist hollows or on slopes where it receives plenty of moisture. King's Crown flowers in summer from July onwards.